Building on the strength of the growing e-Reader market, bookstore giant Barnes & Noble has just formally unveiled its latest device: the NOOKcolor. Rumoured for some time now, but never offering much in the way of solid details, the covers are now off this full-color touchscreen device. Hard internal specs are still few and far between, but in the case of an e-Reader one thing matters most: the screen. Thankfully B&N has seen fit to equip the NOOKcolor with a high resolution 1024x600 7" IPS display. This "In-Plane Switching" technology, often found in professional computer monitors, trumps the S-LCD of Samsung's Galaxy Tab in terms of color fidelity and viewing angles, and has proven to be a success on the iPad. 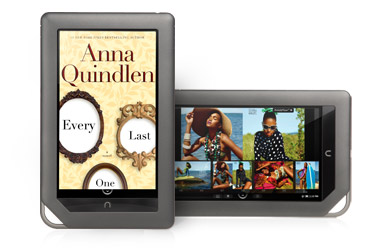 The NOOKcolor also has 8 GB of internal storage as well as a microSD card slot, media playback, document viewing, and all the other good things you expect from an e-Reader. Of course, the NOOKcolor is still running Android beneath it all, as did its predecessor. The OS, however, has been updated to 2.1, and 2.2 is promised in 2011. 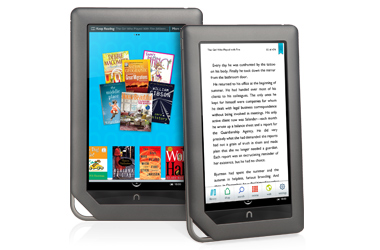 It is also possible to browse the internet on the NOOKcolor, although the device's response times may not be the quickest. 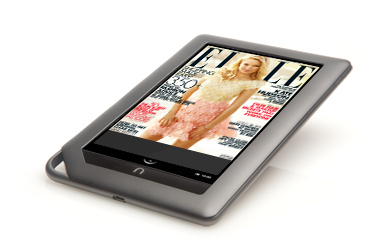 Engadget has gotten some hands-on time with the new Nook, so check out their post below for some in-the-flesh photos.